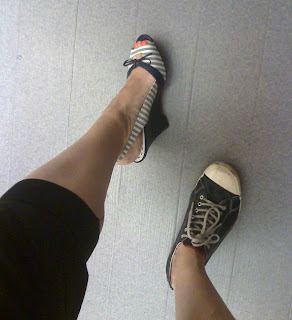 These alice+olivia's are on sale, and are so cute I visit them every time I'm on 34th Street. Remember the leather Converse from Lady Foot Locker? My favorites, maybe ever. These Abaete's are now on sale for $19.99. Love these nautical wedges. More alice+olivia stalking: I've had my eye on that pink leopard wedge for a while. Don't you think they're perfect for stroller pushing down 34th Street? 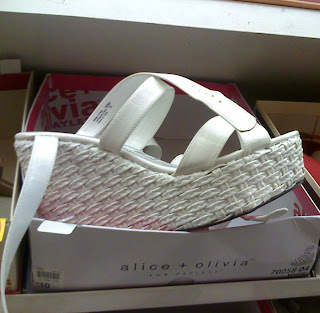 Last, a new a+o obsession, the white basketweave wedge, now also on sale for $19.99. I see myself in a white hair scarf and black bikini *cough,* I mean black maternity swimwear, strolling the boardwalk in my white basketweaves...and this particular beach fantasy can take place on the Jersey shore and involve tiki bars and video arcades. I'm not picky this summer, just give me some beach. 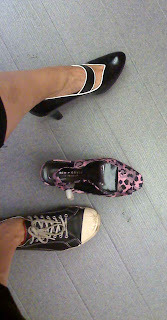 I saw someone wearing the pink leopard shoe recently and loved it...I was without my camera, sadly, or I would have asked her to pose! Seriously. Nab those leopard wedges. No, seriously. Damn those Texans, don't they know we have the only 34th Street that matters! Such amazing shoes! Love the first pair especially.